The chile pepper is as divisive a food as there is. People can either handle the heat and enjoy the pain, or they avoid every bit of pepper like it’s the plague. The group of people in the middle know their limit and stick to the devil they know. When traveling abroad to a chile-pepper-loving country, however, you can be in for a fiery surprise. Every chile pepper — from China to Ethiopia to Peru and back — originally comes from Central and South America. The plant spread around the world during the Age of Exploration and took root in various regions, becoming a staple of the local cuisine. There was no mouth searing tom yum soup in what is modern Thailand before that, and no laal maas in India. There definitely weren’t Spicy King chile-eating competitions in China. In just 500 years, though, the chile has become ingrained in dishes far from its home. The plant has also adapted to wherever it’s been taken. Sometimes that means it’s increased in spice, other times most of the spice has been bred out. The spice level is measured by the Scoville scale. Scoville Heat Units (SHU) measure the amount of capsaicin in a pepper, which is the compound in chile peppers that gives the burning sensation. Peppers that have adapted to different climates have built up different SHU levels, meaning there are plenty of places for true spice heads to travel for their kicks. (For context, jalapeños are 2,500-8,000 SHU.) While not every dish in a country famous for spicy peppers is going to light up your mouth, the option is there. It’s also good to keep in mind that spice levels vary not only from variety to variety but also pepper to pepper, which is why you’ll see a range on the Scoville scale rather than a specific number. These are the spiciest cuisines in the world, ranked by how high commonly used peppers are on the Scoville scale. Note: We’ve left off the engineered peppers bred to be the hottest peppers in the world since those aren’t consumed on a regular basis. Aji amarillo has been called the DNA of Peruvian cuisine. A ripe aji amarillo is a vibrant orange and spicy without being overwhelming, plus a touch of sweetness. Native cultures have used the peppers for hundreds of years, and this pepper from what is now Peru is likely one of the mother peppers spread around the world. The brown berbere is a rich chocolate color and is a component of many different Ethiopian spice blends. The lower spice level (at least, low relative to others on this list) allows the smoked flavor in dried berbere to show through. Most commonly found in Chinese food from Hunan and Szechuan, Tien Tsin peppers are about two inches long and bright red. They’re often dried and thrown seeds and all (seeds are where much of the capsaicin is) into dishes. They’re especially potent when paired with Szechuan peppercorns, which release a compound that numbs your mouth as you eat them. 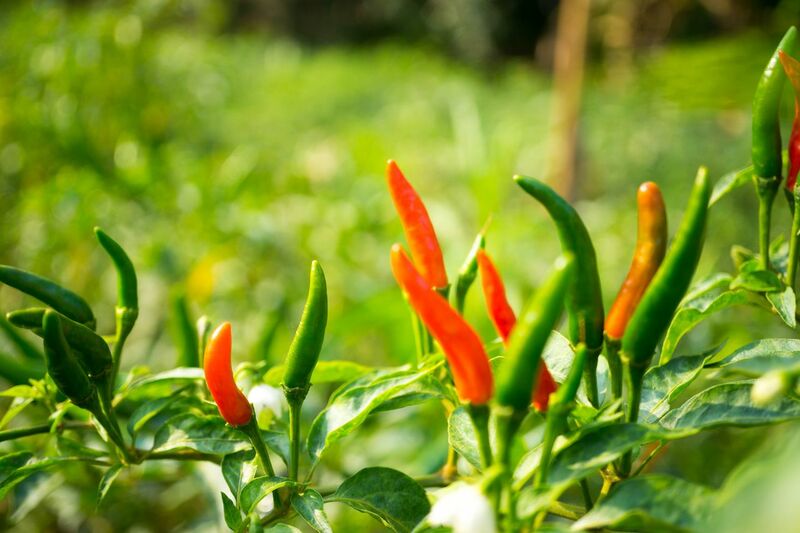 There are many types of Thai chiles, but the most common is the phrik khi nu. Chile peppers grow throughout the country and are used in a wide variety of dishes. If you’ve ever eaten authentic Thai food or visited Thailand, there’s a good chance it was some of the spiciest food you’ve ever eaten. It looks like the tien tsin in size and color and also grows with the pepper facing straight up like the tien tsin. The main difference in appearance is a slight curve to the Thai chile. You’ll really notice the difference in taste, though, as the cap on how spicy a Thai chile can get is higher. India’s cuisine is as diverse as it is vast. The food many Westerners think of as Indian is far from authentic (and there are many better curries than chicken tikka masala). The jwala pepper is a popular one throughout the country and hits between 20,000 and 30,000 SHU, but another common pepper really turns it up a notch. The Byadgi chile from the state of Karnataka is one of the more popular spicy chiles in the country. It’s a bright red color and often dried before being used to spice up masalas (sauces) and soups. There’s nothing Scotch about the Scotch bonnet pepper. 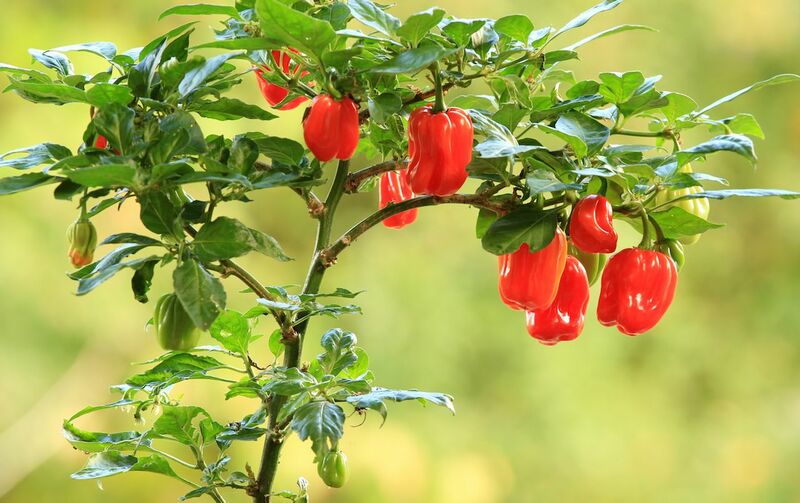 The pepper is eaten around the Caribbean, but it’s most famously consumed and grown in Jamaica. Scotch bonnets vary in color from yellow to red when ripe and are an important part of Jamaican food culture — it’s what puts the kick in jerk chicken. There’s a bit of a vegetal sweetness if you can make it past all the heat blasting your mouth with every bite. Mexico cannot be defined by just one pepper. There’s the jalapeño, the common pepper known and loved around the world. Then there’s the pequin, or bird’s pepper, that’s slightly hotter and used in many salsas. Few chile peppers capture the imagination of spice fiends like the habanero, however. Mexico’s hottest chile is originally from modern-day Peru, but today, most habanero production is centered around Yucatán, the Mexican state that juts into the Caribbean.